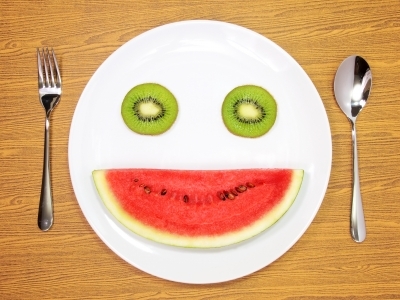 Maintaining a healthy smile starts with the food we put into our bodies at each meal. Your children may think that candy, chips and soda are great. These kinds of foods, however, leave residue behind that form plaque on your child’s teeth and can cause long-term harm. Providing a variety of healthy snacks will help your kids stay cavity-free! In order to keep your child’s teeth strong with healthy snacks, it’s a good idea to work them into your diet as well. Incorporate plenty of fruits and vegetables into each meal, and practice good oral hygiene in front of your kids by brushing and flossing twice a day. These habits will help your family realize the importance of making good choices to keep their teeth healthy. Including healthy snacks in the form of a variety of fruits and vegetables into your family’s diet doesn’t have to be one person’s responsibility. Buy and prepare fruits and vegetables in different ways, then ask your children’s opinions about which healthy snacks they liked the best. These kinds of conversations can also be a great opportunity for all of you to discuss what kinds of foods are good for their teeth, including what healthy snacks they prefer. Include them when possible, and they’ll be more enthusiastic about the changes regarding what they eat. These can be served with low-fat yogurt or cream cheese to combine savory and sweet. Combine these with condiments like low-fat dressing or peanut butter for a yummy snack. Choose low-fat or non-fat options to keep a diet low in fat. Follow up healthy snack and meal times with good dental hygiene habits. Make sure that your kids are keeping their teeth clean by brushing and flossing regularly, removing harmful plaque from those hard-to-reach places on their teeth. Invest in some kid-friendly products, like character toothbrushes, plastic cups for rinsing, different colors of floss, and a variety of toothpaste flavors. Take turns brushing with them to help your kids practice doing a good job taking care of their teeth. These healthy snacks and good daily dental hygiene will help your entire family have healthy teeth for a lifetime.